Learn about the Lorex Security Surveillance Camera System with 4 Cameras & 4 Channel DVR for your surveillance needs. Includes pricing & features. 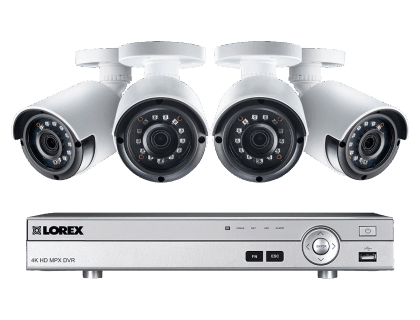 The Lorex Security Surveillance Camera System with 4 Cameras & 4 Channel DVR is a complete surveillance solution from the Lorex security camera range. It comes with a 4K Ultra HD MPX Security DVR and four 1080P HD security cameras capable of recording up to 30 frames per second. 4K Ultra HD DVR can support up to 8 cameras. Pros: Easy to set up, user-friendly software, excellent video quality. Cons: The App for iOS crashes occasionally. Bottomline: The Lorex Security Surveillance Camera System is easy to install and use, and boasts clear images and night vision. What are some alternatives to the Lorex Security Surveillance Camera System with 4 Cameras & 4 Channel DVR? Where can I buy the Lorex Security Surveillance Camera System with 4 Cameras & 4 Channel DVR? The Lorex Security Surveillance Camera System with 4 Cameras & 4 Channel DVR is available via Amazon and the Lorex website. Does the Lorex Security Surveillance Camera System with 4 Cameras & 4 Channel DVR work at night? Yes, the Lorex Security Surveillance Camera System with 4 Cameras & 4 Channel DVR features infrared (IR) LEDs, allowing you to see up to 130 ft. away in regular nighttime conditions, and up to 90 ft. in complete darkness. Integrated IR cut filters ensure accurate color images in all lighting conditions. Can the Lorex Security Surveillance Camera System with 4 Cameras & 4 Channel DVR be used in any weather? Yes, this IP66-rated Lorex camera system operates in all weather conditions, including wind, rain, and snow, and withstands temperatures between -22 °F and 140 °F.